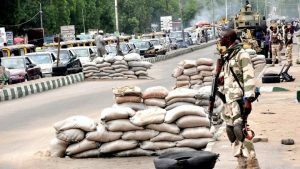 4 female suicide bombers killed in attempted Borno attack – Royal Times of Nigeria. Four female suicide bombers have been killed in a suicide bomb attack at Mandirari Village in Kondugu Local Government, Borno. The News Agency of Nigeria reports that an official of the Borno State Emergency Management Agency, Malam Bello Danbatta, confirmed that the attack occurred late on Wednesday. Danbatta said that the agency had since deployed its rescue team to the village. He said that the team had also evacuated people, who sustained injuries in the attack to the Maiduguri Specialist Hospital for medical attention.